UFO SIGHTINGS DAILY: Artists of long ago incorporate their UFO Sightings & Abductions into their paintings, Video, UFO Sighting News. 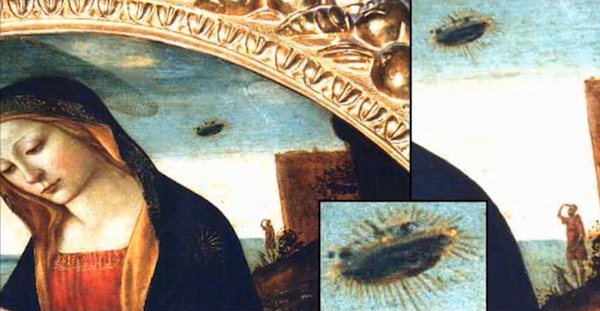 Artists of long ago incorporate their UFO Sightings & Abductions into their paintings, Video, UFO Sighting News. Art is like the earliest forms of photography, recording the true history of mankind all the way back the those paintings on cave ceilings and walls. When an artists and a regular person stand side by side and observe a UFO sighting, many irregularities will come from their reports. The regular person will give one or two details, but the artist with his discriminating eye for beauty will describe twenty or more important details that the other person easily overlooked. So, looking at the paintings of historical artist is extremely important. I'm not saying an artist born in the 1300s or 1400s was transported to the birth of Jesus to witness and then paint it. What I am saying is that these artists had a more personal experience, one where they themselves witnessed a UFO or were abducted by aliens, and being unable to speak of it, instead they hid their experience in the painting, hoping that future generations may understand it better than his own towns people 600+ years ago who might label them as the town fool. Look in the above photo, you see something that doesn't belong there, an old man and looking upward at a UFO. He painted his personal experience into the important religious painting to preserve it forever. Many artists in the world used secret messages in their paintings.